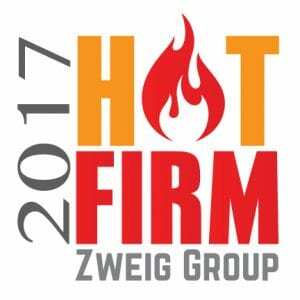 PK Electrical Amongst Preeminent Electrical Engineering Companies | Zweig Group 2017 Hot Firm Award Winner! The Zweig Group’s Hot Firm list is an annual ranking of the 100 fastest-growing firms in the architecture, engineering, planning and environmental consulting industry. This ranking is the only list celebrating and honoring growth in the industry. Hot Firm rankings are based 50 percent on percentage growth rate and 50 percent on dollar revenue growth rate, over the previous three-year period. Any architecture, engineering, planning, environmental consulting, or related industry firm based in the United States or Canada can apply to the Hot Firm List. PK Electrical will be named at the Hot Firm and A/E Industry Awards Conference held at the Fairmont Olympic Hotel in Seattle, Washington on September 21-22, 2017. Awards will be given out at a black tie awards ceremony on the evening of September 22.